Angelos Tzotsos was born in Ioannina, Greece, in 1980. 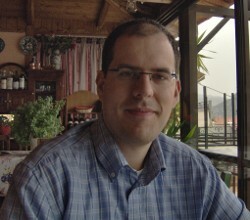 Angelos is a remote sensing expert with background in surveying engineering and software development. He has a MSc in Surveying Engineering/GeoInformatics and a PhD in Remote Sensing from National Technical University of Athens. He is currently Vice-President and Charter Member of the Open Source Geospatial Foundation (OSGeo) and a Member of the Open Geospatial Consortium (OGC). He is the chair and release manager of OSGeoLive and heavily involved in many OSGeo and Open Source projects: pycsw, OrfeoToolbox, GeoNode, ZOO-Project, OWSLib, MapServer, QGIS, ckanext-geodatagov, ckanext-publicamundi, Gnorasi. He is also an official developer for the openSUSE GNU/Linux distribution as well as a maintainer of the UbuntuGIS project. SDI (geodata.gov.gr) and he was a consultant/developer for the US open data catalog data.gov. He is also the co-founder of EOfarm P.C., specialising in earth observation and geospatial applications development.